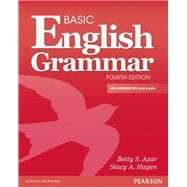 Basic English Grammar is a classic developmental skills text for beginning students of English as a second or foreign language. It uses a grammar-based approach integrated with communicative methodologies to prmote the development of all language skills. While keeping the same basic approach and materials as in earlier edtions, the fourth edition continues to build on the foundation of understanding form and meaning by engaging students in meaningful communication about real actions, real things, and their own lives in classroom context.